I went to Target a few Saturdays ago and was amazed to see a black Lamborghini parked in a distant corner of the parking lot. Not a usual sight there. I couldn’t resist the opportunity to whip out my cheap camera phone to take a picture. 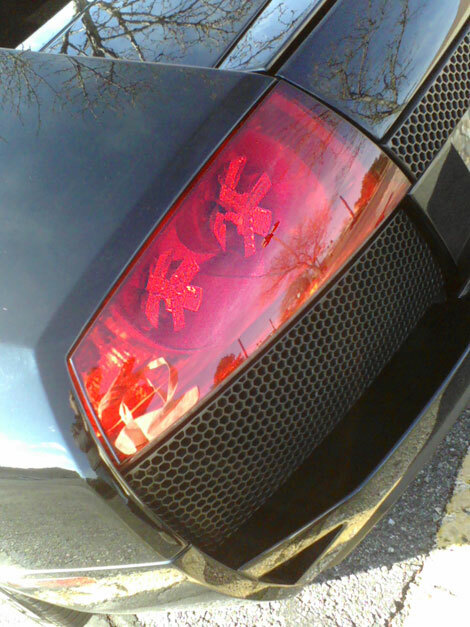 I zoomed in here for you to see the whimsical concentric starlight pattern that makes up the taillights. This is a very serious car. Serious price, serious performance. But the designer felt the need to inject a little bit of fun into the equation. I’d urge you to do the same. 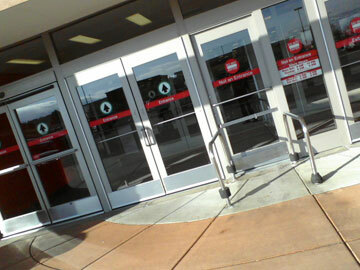 Most Americans are faced with a choice when they enter a big retail store… go through the automatic doors or the push-open doors? 1. You will get some additional exercise that would not otherwise be part of your life. 2. You will save the energy that it would take to open the doors. 3. You will save the store the cost of the electricity it would take to open the doors. If you make this choice enough times, you will make a difference. If everyone you know makes this choice, we’ll all make a significant difference. Note “Sites” in the tabs at the top of this site. I took my blogroll off my sidebar. I used to have the links of several sites there. I changed that, just for a little variety. 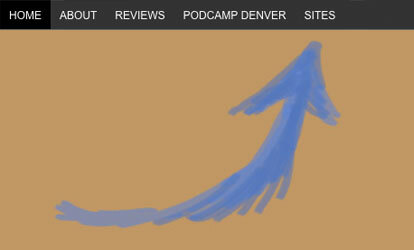 And I also added descriptions to each site, so you know the ride you’re about to take. Take a lesson from the cat, my child. Our cat is the most relaxed creature in the world. 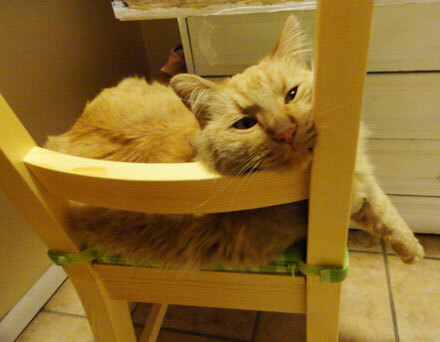 He can sleep just about anywhere. He has to, in order to get his required 23 hours of sleep each day. Friends fall into a spectrum. Some people we just love – and others – well, not so much. Of course you know that. But sometimes there is guilt involved. If someone falls into the not so much end of the spectrum, we often feel guilty – that we should like them more. Just let people fall naturally where they fit into your spectrum. But give yourself freedom to realize that your feelings toward them may change over time. Or not. 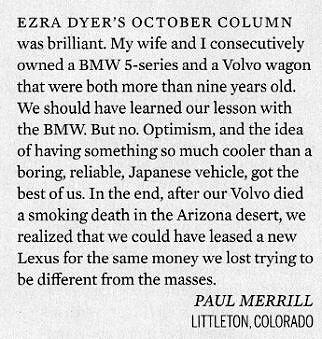 This letter appears in the December 2011 issue of Automobile Magazine. Roughly the same amount of time it would take for you to comment on a blog post – and have 21 people see it – can yield a few more views, if your thoughts are published in a magazine. Print may be dying, but there is still a good number of people who read printed magazines. Obviously, I’m one. If you’d like to read more of the dead Volvo story, it’s in my previous blog. And here’s Ezra’s column. The December Automobile Letters to the Editor section had more letters about that column than I’ve ever seen focusing on any article or column before. One thing I’ve learned as I’ve been a parent of three kids is that you must let your kids get muddy. We were hiking up near an alpine lake, and the water level was way below normal. 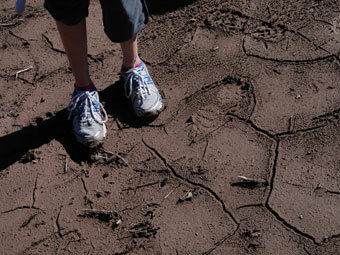 The water must have drained fast, as the remaining lake bed was one big mud pit. My kids know me well enough that they asked Heather and me if they could run around out there. I had no problem saying, “Sure!” In fact, I joined them. I’ve seen a lot of parents doing the “helicopter parenting” thing – swooping in whenever anything goes wrong and rescuing their kids from harm. Sometimes kids have to learn the hard way. Of course there’s a balance in this… you don’t want your 3-year old to learn about hot stove burners the hard way. I doubt if you read Autoweek magazine. That’s why I’m sharing this story from the October 31, 2011 issue. 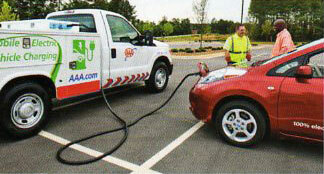 AAA now has trucks devoted to charging stranded electric cars in six different US cities. At the moment, that would only be two vehicles – the Nissan Leaf and the Mistubishi i. And there are maybe 25 actual cars floating around the US. So it’s a near-future-oriented program. Anyhow, I was amused at the thought of a relatively low fuel economy truck being driven across town to charge up an “ultra-green” car. It kind of defeats the purpose. My constructive suggestion? Use a much cheaper tow truck and tow the car to the owner’s home. Or an office or store that has an electric extension cord. Electric cars aren’t ready for prime time. Yet.